We’d love your help. Let us know what’s wrong with this preview of The Five Lessons a Millionaire Taught Me About Life and Wealth by Richard Paul Evans. Easy to understand and simple to apply, The Five Lessons a Millionaire Taught Me About Life and Wealth is one of the most powerful books ever written about money. This book will change your life. When Richard Paul Evans was twelve, his father, a building contractor, shattered both his legs. With no insurance, no income, and eight children, the family was destitute. At that Easy to understand and simple to apply, The Five Lessons a Millionaire Taught Me About Life and Wealth is one of the most powerful books ever written about money. This book will change your life. When Richard Paul Evans was twelve, his father, a building contractor, shattered both his legs. With no insurance, no income, and eight children, the family was destitute. At that difficult time young Evans was introduced to a kind multimillionaire who taught him the five secrets of wealth. Today, Evans credits those lessons not just with bringing him wealth and success but with bringing him freedom and opportunity in a world where financial slavery is ubiquitous. 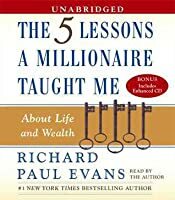 Wise and compelling, The Five Lessons a Millionaire Taught Me About Life and Wealth can be read in a single sitting and will leave you with a new view of what it means to be rich -- and convinced that you, too, can build wealth. The Five Lessons a Millionaire Taught Me About Life and Wealth is endorsed by financial consultants, churches, schools, and marriage counselors. To ask other readers questions about The Five Lessons a Millionaire Taught Me About Life and Wealth, please sign up. Meh. He gave good advice and it was ok. The problem was it wasn't really anything I hadn't heard before. And his budgets and other appendices at the end kind of sucked. If you're going to read a money self-help book, read something by Dave Ramsey. This book has been on my list to read for a long time because the “millionaire” referred to was a relative of my husbands. I thought this book had good insights and tips for people to make small changes in their spending habits. There were a few similarities to Ramsey’s money makeover book and I can see why some information in here could be useful to those trying to save money. It’s a quick and easy read. Listened to it on Hoopla. As with other finance books, I thought the ideas presented here were reasonable and smart but not necessarily feasible. I would love to implement many of the ideas presented but feel that someone would already need to have accumulated a fair amount of wealth before they could do so. My husband and I are young and just starting out, and while we tend to be very strict with our budget already, we still struggle at times with being able to invest much, save much, etc. Life sure is expensive! Nevert As with other finance books, I thought the ideas presented here were reasonable and smart but not necessarily feasible. I would love to implement many of the ideas presented but feel that someone would already need to have accumulated a fair amount of wealth before they could do so. My husband and I are young and just starting out, and while we tend to be very strict with our budget already, we still struggle at times with being able to invest much, save much, etc. Life sure is expensive! Nevertheless, I really appreciate the ideas put forth in this book, so perhaps I can revisit them later down the road. I always feel more inspired, motivated, and energized about finances after I read one of these books. I am already quite responsible financially, but they push me to challenge myself even more to be better. Take this book for what it is. It's simple but offers sound advice. The first lesson, "decide to be wealthy," may seem silly at first glance, but it's one I had already taken to heart, even before reading this book. It's a good mindset to have. I believe that deciding to be wealthy and desiring to be rich are two completely different things. I'm sure most people desire to be rich, but not everyone decides to be wealthy. Deciding to be wealthy means deciding to take your finances completely into your own hands. It means making sacrifices to ensure a better future. It means being responsible for your actions and your financial life. This is probably the most important lesson in the book. While I haven't become wealthy yet (and it will probably be a long time before I do! ), I will continue to make those decisions every single day and work hard for my family's future. 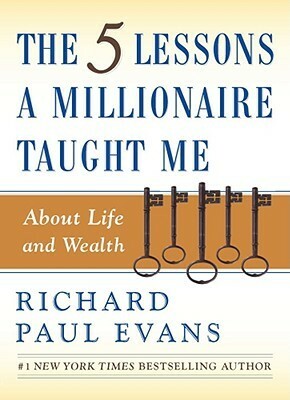 In the Five Lessons a Millionaire Taught Me, Richard Evans draws from his own life experience and the personal stories of others, to make the proposition that money should not be the dominant fixation in our lives. Instead, he proposes five philosophies that we can apply to enjoy freedom in all areas including family, intimate relationships as well as our spiritual life. I like Evans' conversational style of expressing important values that anyone can apply in his or her life. While there are many personal finance books, this came out as particularly interesting; the five principles advocated here seem to offer more depth and practicability than most other personal finance or get rich books. The five principles include: decide to be wealthy, take responsibility for your money, keep a portion of everything you earn, win in the margins. I would have given this book a 5 except for one thing at the end which I will get to. First off, it is simple, straight forward advice that everyone can use. I am thinking of getting a copy for my niece and her husband who are recently married and saving for a home. A lot of stuff we all know, but just don't do. For example, think before you purchase something no matter what it is. Do we need to eat out so often? Is that going to leave us as happy as financial security. Evans doesn't want us all I would have given this book a 5 except for one thing at the end which I will get to. First off, it is simple, straight forward advice that everyone can use. I am thinking of getting a copy for my niece and her husband who are recently married and saving for a home. A lot of stuff we all know, but just don't do. For example, think before you purchase something no matter what it is. Do we need to eat out so often? Is that going to leave us as happy as financial security. Evans doesn't want us all to be tight wads, he just wants us to give up a few things we really don't need in the big picture of things. I read the women's version of this and was surprised how much I liked it. Very simple and effective tools, easily learned and applied...not a "budget", but a way of setting goals financially and taking an active part in planting the financial seeds in one's own financial garden, growing for rainy days and better times, regardless of how the national economy is going, etc. I thought he had a lot of good points, especially about interest and savings. The only thing that seems a little disheartening is that it's hard to feel like you can become very affluent when you are comparing your income to that of a best selling novelist like Richard Paul Evans. However, I do realize that most people are not in his situation and he understands that as well and is trying to help the everyday person. The tips in this book are good and helpful. I think that the organization of the book is good too. I think it could have had the tips a little better told. I missed one or two of them but I had to go back and read over it again because I didn't pick up that it was one of the five tips. Maybe it's just me. I think that the book is great. Some personal development books have resonated a little stronger with me but this one is good. Once you've read Dave Ramsey's "Total Money Makeover" make this your next great read. If you're a woman, read his book specifically written for women (same title but it includes "for Women" on the cover.) He hits on a lot of excellent points that we women need to be aware of. We are on track to start living a fresh new way that includes paying ourselves for the future. If this were my first financial book I ever read, it probably would be 4 stars. It is a fast and interesting read, full of stories and experiences, but it only has the basics and makes me question how, or what next. It would be a good motivational read for someone struggling to manage their money, but did not dive into much of the nitty gritty. Overall, worth the read. This was a good book with some basic common sense ideas on how to save money/become a millionaire. I liked a lot of the ideas and thoughts. Richard Paul Evans was good at compiling quotes and stories from other people to make a short little book about finances. Here is one more idea on how to save some money. Don't buy this book. Check it out from a library if you really want to read it. This book was a perfect start to my journey in learning about money and my relationship with it. Since I'm a novice when it comes to it, the book was beneficial. I don't think it would spark an interest in someone that is more advanced in money management. I loved that it was a quick and easy read and I can build a foundation with what I learned from this book. This was such an informative and amazing read! I enjoyed it thoroughly. I think the best part is, it's easy to understand, and there are tons of relatable stories to illustrate the points he makes. 10 out of 10 would recommend taking time to read this book. It is a small but very practical book. I took a lot from this book and liked how straight forward it was. He also added personal sotied into the mix which was nice to read and get the take home message. This review has been hidden because it contains spoilers. To view it, click here. 1. Decide to be wealthy and change your habits. 5. And give back to community and give money to those less fortunate. This book is great for people who have high consumer debt and can’t control their spending habits. In my eyes, the book can help about 85% of the population who struggle with money and have a lot of consumer debt. I read this book a while back in time and took some notes from it. Definitely made some good concept and worth checking. It's only 106 pages, but it is the best financial book I have ever read. This books summarizes points many other finance books drill into your head. It's a quick and easy read and well worth keeping on your shelf to go back to time-and-time again. This is a very insightful book. I am going to start now. Quick but really good, definitely one of the better books on the subject out there. I will get this book for my grandkids!!! Was a good fast book. Similar to other teachings in a quick format. great, easy to understand wealth building book. Very valuable lessons everyone should know. I will be applying this. Very, very basic. Could have been written in a two page summary. This was a quick, easy read packed full of useful, practical and understandable information that everyone needs to start implementing in their lives today. Great book! You can read it in just a couple of hours. It is very basic and anyone can do it. You don't have to already have money. I can't wait to be on my way to be wealthy. This was a good, quick read to be reminded of good financial principles. I knew most of it, but I did get a new tip for my water heater.